New York Magazine's "Yesteryear" issue has not one, but eight different covers to honor some of the century's greatest musicians. It's the magazine's fourth annual yesteryear celebration and looks at 100 years of music in New York, or as the cover story says, "the town that put the pop in music." The issue honors 26 musicians who shaped NY music and includes some great throwback pictures of the stars when they were young. 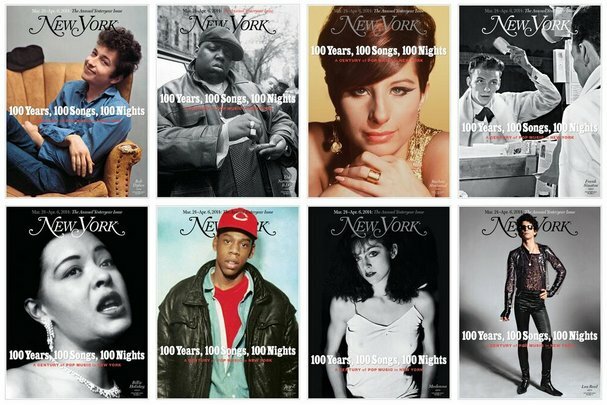 The eight covers feature Lou Reed, Madonna, Bob Dylan, Barbra Streisand, Notorious B.I.G., Billie Holiday, Jay-Z and Frank Sinatra, along with the words "100 Years, 100 Songs, 100 Nights." Check out the cover story from New York Magazine here.